Photographic evidence of snow - Adding chaos to the world, one thought at a time. I mentioned snow earlier. Have some evidence. 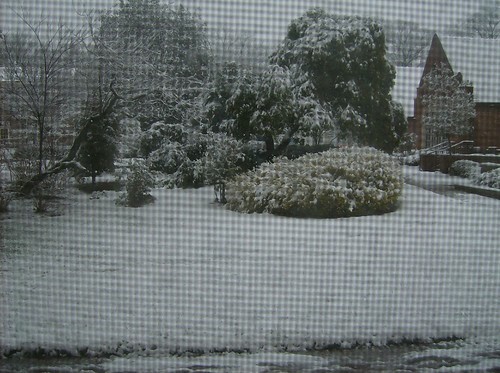 This is what the snow looks like from my bedroom window. Well, one of them. It doesn't help that my desk faces the window and I keep staring out the window and watching the snow when I should be working. So at some point this afternoon Renu and I decided to build something outside. Ours is at the very end, but see some of the other creations that we passed on the way. 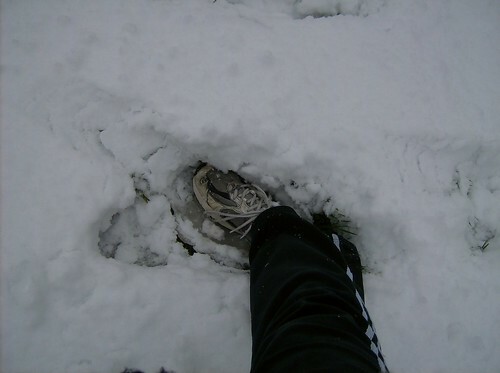 To give you an idea of how deep the snow was, this is my foot in the snow. It's getting dark now, but it's still going a little out there. 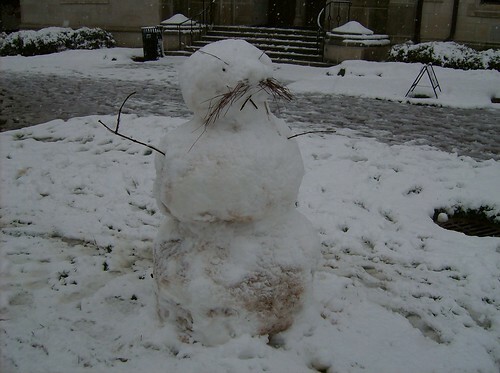 I feel sorry for this snowman, the first we saw. Wasn't last month Love Your Body month? That applies to non-humans too! 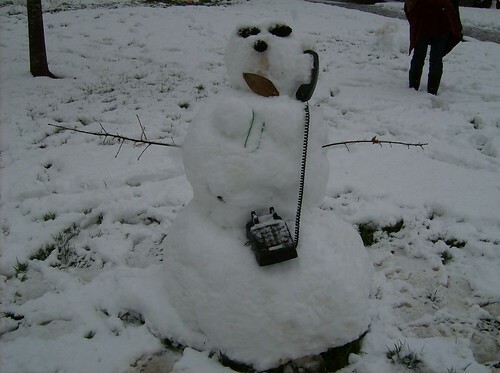 Yes, a snowman on top of a snowman. 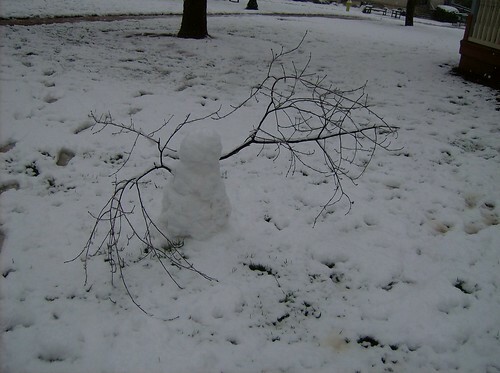 "Fractal snowman!" I exclaimed as I tried to add a third snowman to the sequence. It didn't work. This one was actually the last we saw. 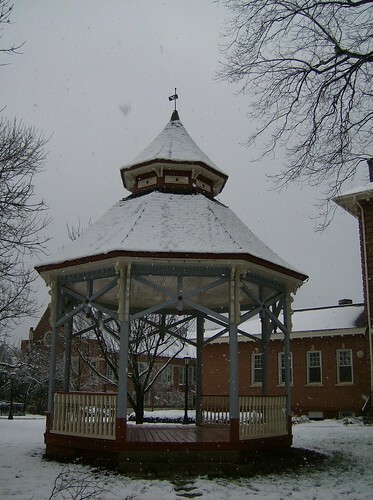 Obligatory picture of the gazebo. 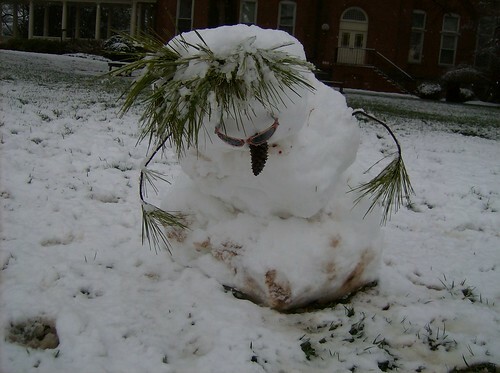 Yes, a snow-woman. And yes, those are bottles of alcohol at her feet. I'm impressed at how the creator(s) managed to clothe her. My pine needle whiskers. Let me show you them. 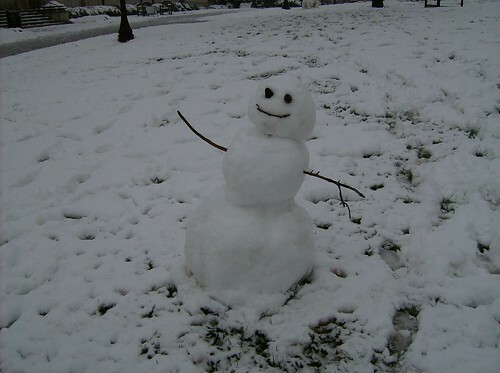 A cute and simple snowman. This one brings back childhood memories, like the time my brother and neighbors and I made a huge snowman when we were kids and it stayed up for months until one of my neighbors decapitated it with a baseball bat. I have no idea what this one's bowing at, but it's pretty fierce. The sunglasses and pine needles add that touch to it. 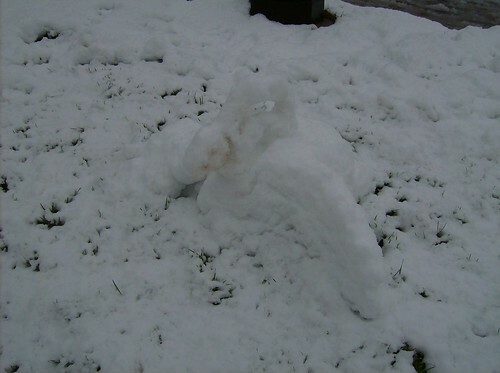 It's not a snowman, it's a swan! And a good one at that. I'm impressed that they got the neck to stay up. My humongous arms, let me show you them. I'm pretty sure I know where they got that phone from. 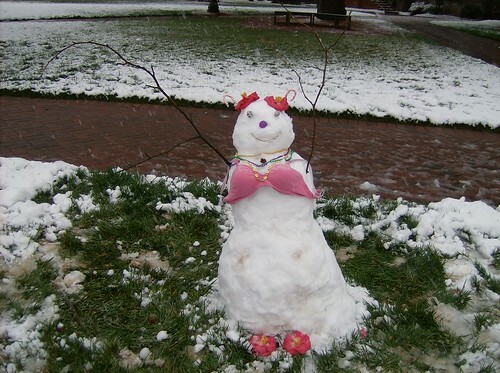 But it's another snow-woman! 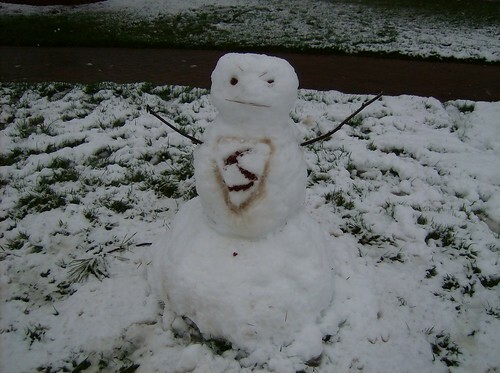 It's Super Snowman! I wonder why he's mad, though. Fun fact: Dean Diedrick passed us as we were finishing her up and took a picture of the three of us. Possible immortalization? Ahaha, that's a lot of snow-things. I hope most of them are still alive when I have to go to class tomorrow (since we never get snow days). These are the greatest ever! I wish my neighborhood was half as creative as this. 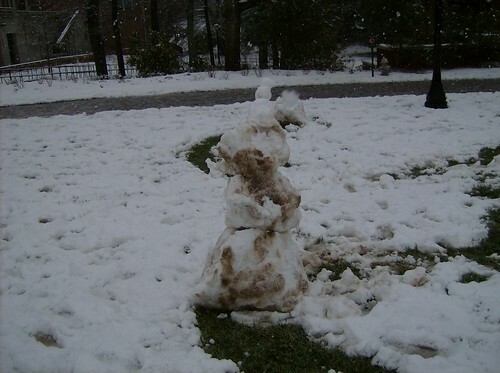 When I was younger, I used to make Calvin and Hobbes style snow goons in the yard, with three heads, six arms, a hole in the torso,etc. :-) Yours are far more fun! 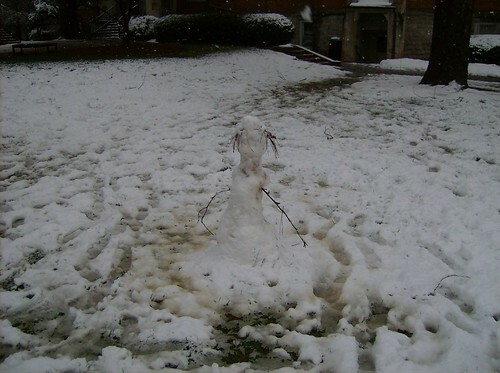 This reminds me of a time I saw a snowman still standing long after the snow melted and it was well above freezing. 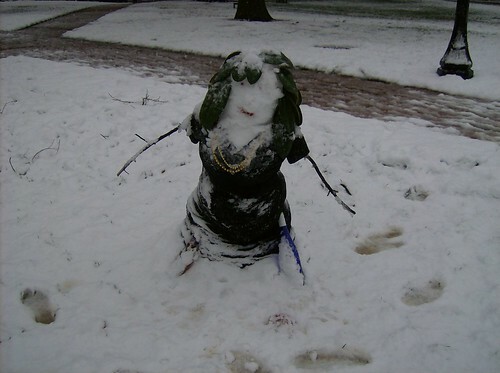 It was more of an Iceman than a snowman. I think it lasted a week or so, though it was more of a blob.